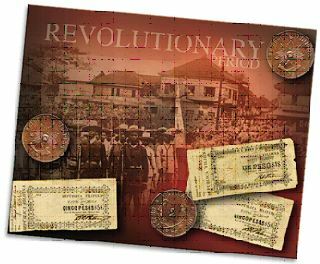 " History of the Philippine Coinage "
1491–1542 Lapu-Lapu was the ruler of Mactan, an island in the Visayas, Philippines, who is known as the first native of the archipelago to have resisted the Spanish colonization. He is now regarded as the first Filipino heroic. On March 16, 1521, The Philippines was discovered by Ferdinand Magellan. At dawn on 27 April 1521, Lapu-Lapu led 1,500 Muslim Mactan warriors armed with barong, spears, kampilan and kalasag, in a battle against Portuguese explorer and conquistador Ferdinand Magellan who led a force of 60 Christian soldiers armed with guns in what would later be known as the Battle of Mactan. During the battle Magellan and several of his men were killed. He is regarded as a Muslim coming from the Tausug tribe as chronicled under the Sulu Sultanates. No clear evidence can be proven that he was an animist aside from mere speculation. He used a kampilan as mentioned by Antonio Pigafetta, a sword used by blue blood Muslims in the Philippines and Southeast Asia. The Philippine Government has officially acknowledged him as a Muslim warrior. 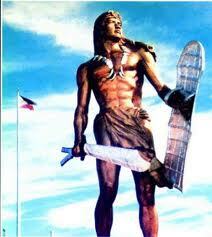 According to Sulu oral tradition, Lapu-Lapu was a Muslim chieftain, and was also known as "Kaliph Pulaka". The people of Bangsamoro, the Moro homeland in the Philippines, consider him to be a Muslim and a member of the Tausug ethnic group. The 1898 Philippine Declaration of Independence refers to Lapu-Lapu as "Rey Kalipulako de Maktan" (King Kalipulako of Mactan). Pre-Hispanic Period Trade among the early Filipinos and with traders from the neighboring islands was conducted through barter. The inconvenience of barter later led to the use of some objects as a medium of exchange. Gold, which was plentiful in many parts of the islands, invariably found its way into these objects that included the Piloncitos, small bead-like gold bits considered by the local numismatists as the earliest coin of the ancient Filipinos, and Gold Barter Rings. Spanish Colonial Period The Spanish period saw a multitude of currencies circulating in the Philippines, the most popular being the Mexican peso. 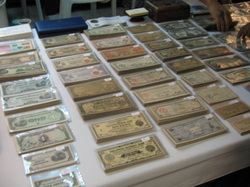 However, other currencies like the Alfonsino peso, Mexican cob coins (locally called hilis kalamay), other currencies and coins from other Spanish colonies were also used. 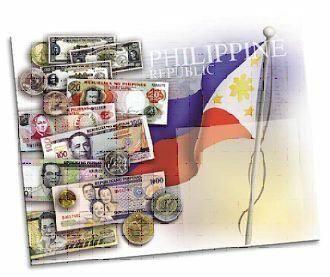 Many of the coins that reached the Philippines came because of the Manila Galleon which dominated trade for the next 250 years. These were brought across the Pacific Ocean in exchange for odd-shaped silver cobs, which are also known as macuquinas. 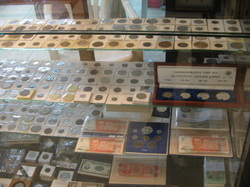 Other coins that followed were the dos mundos or pillar dollars in silver, the counterstamped coins and the portrait series, also in silver. In the 18th century, the Royalty of Spain authorized the production of copper coins by the Ayuntamiento (Municipality) of Manila in response to the acute shortage of fractional coins. These were called barrillas and first appeared in 1728. 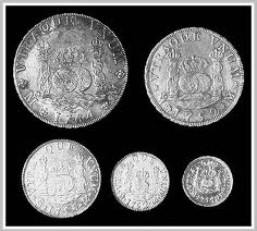 In 1852, the peso was introduced at a rate of 8 reales = 1 peso. However, not until 1864 did the Philippines decimalize and the real cease to circulate. Piloncitos are tiny engraved bead-like gold bits unearthed in the Philippines. 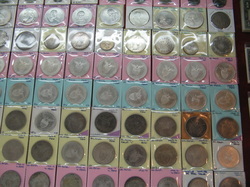 They are the first recognized coinage in the Pre-colonial Philippines, circulated between the 9th and 12th century. They emerged when increasing trade made barter incovenient. The term piloncitos comes from the word pilon, a local sugar container that resembles the coin. They are engraved with the Brahmanic character "ma" which looks like an upside down "R". We can only guess that this character refers to the pre-colonial kingdom of Ma-yi which is roughly the Philippines we know today. Many piloncitos were unknowingly melted into jewelry in the past and very few excist today. 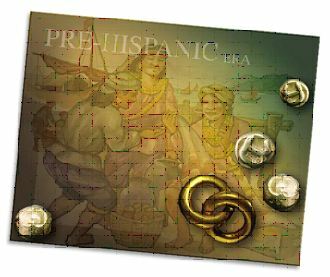 Gold Barter Ring or Earing, a pre-hispanic era, used as a form of money or mode of exchange. Tubular and bent to a circles 4.8 cm diameter. 16.9 grams, 14k red gold. Existing literature states that barter rings were introduced to what is now the Philippines by West Asians in the 1st century AD and was used until the 16th century. The Manila galleons or Manila-Acapulco galleons (Spanish: Galeones de Manila-Acapulco) were Spanish tradingships that sailed once or twice per year across the Pacific Ocean between Manila in the Philippines, and Acapulco, New Spain (present-day Mexico). The name changed reflecting the city that the ship was sailing from. Service was inaugurated in 1565 with the discovery of the ocean passage by Andrés de Urdaneta, and continued until 1815 when the Mexican War of Independence put a permanent stop to the galleon trade route. Though service was not inaugurated until almost 50 years after the death of Christopher Columbus, the Manila galleons constitute the fulfillment of Columbus' dream of sailing west to go east to bring the riches of the Indies to Spain, and the rest of Europe. 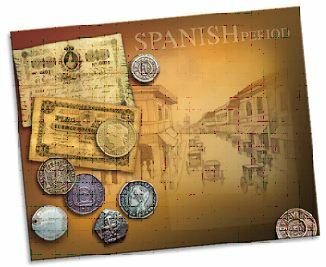 Exploring the New World, Spain soon discovered plenteous deposits of gold and silver. To export the precious metal to Spain quickly, the colonial mints produced irregular coinage called cobs. A bar of silver was cut into chunks of the appropriate weight and then struck with a hammer between crude dies. The size, shape and impression of these cobs was highly irregular but they were the proper weight. Often only a small portion of the image on the die was impressed on the silver. Loading the cobs onto gallion sailing ships, they headed up the coast of Florida before turning east toward Spain. 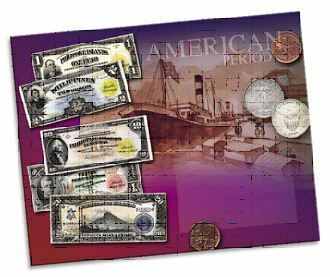 With no Weather Channel to guide them, hurricanes often sunk the ships and the cobs became treasure coins. To this day people still use metal detectors along the beach to uncover these cobs of gold and silver. DOS MUNDOS or PILLAR COINAGE. Spanish Colonial. These beautiful silver coins proclaimed by their bold design Spanish dominion over the Old World of Europe and the New World of the Americas and the East. They steadily came to replace the much abused cob coins through the medium of a prescribed circular shape sealed against debasement by a distinctive milled floral edge.The coins were the famous "pieces of eight" (referring to the 8-real coin) of legend and literature. Exquisitely designed, and strictly of 916.66 fine silver, these columnarias were minted with screw presses in the same denominations as the earlier cobs and immediately established the well earned reputation of being the best known and respected coins in every part of the known world, making them the prototype of modern international currency. The Republic of the Philippines, an archipelago in the western Pacific 500 miles (805 km.) from the southeast coast of Asia, has an area of 115,830 sq. mi. (300,000 sq. km.) and a population as of today year 2011 approximately 91,983,000. 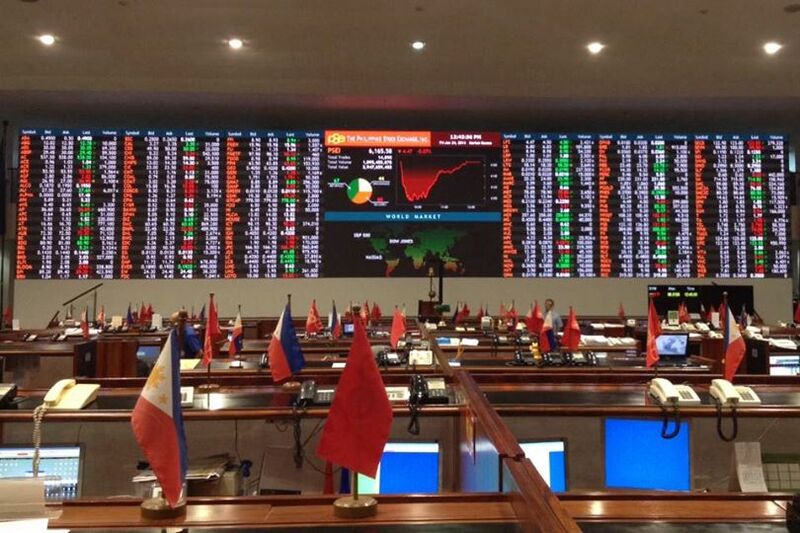 The Capital is Manila. 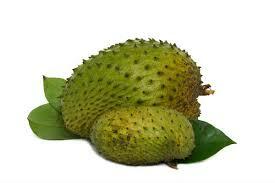 The economy of the 7,000-island group is based on agriculture, sugar and hemp are exported. Migration to the Philippines began about 30,000 years ago when land bridges connected the island with Borneo and Sumatra. Ferdinand Magellan claimed the island for Spain in 1521. The first permanent settlement was established by Miguel de Legazpi at Cebu in April of 1565; Manila was established in 1572. A British expedition captured Manila and occupied the Spain by the treaty of Paris, 1763. Spain held the Philippines amid a growing movement of Filipino nationalism until 1898 when they were ceded to the United States at the end of the Spanish - American War. 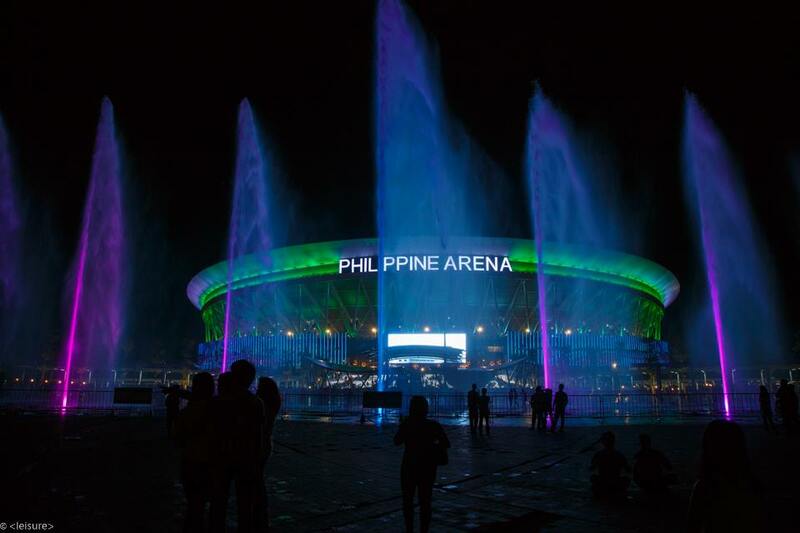 The Philippines became a self-governing commonwealth of the United States in 1935, and attained independence as the Republic of the Philippines on July 4, 1946. 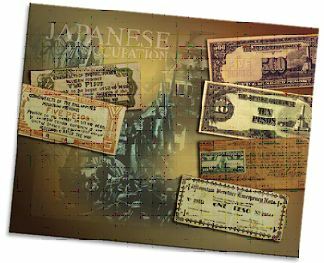 We accept papercoinage fundraising donation and to support this webpage.